On Thursday night after 8:30 p.m., the Metro Blue Line will again run every 40 minutes between 7th Street/Metro Center and Willowbrook Station due to essential track maintenance that is part of the ongoing Blue Line improvement project. 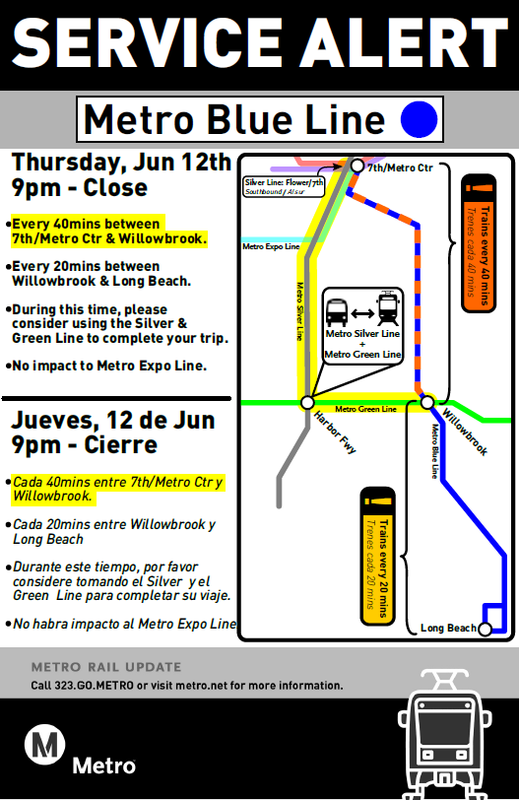 Trains will serve the remainder of the Blue Line, between Willowbrook and Long Beach, every 20 minutes after 8:30 p.m. This means every other northbound train will turn around at Willowbrook Station, and its destination sign will either display “Willowbrook” or “Imperial.” Customers should expect all trains continuing to 7th Street/Metro Center to arrive on the Downtown L.A.-bound track between Vernon and Willowbrook Station. The Expo Line will not be impacted by the track work and will follow a regular Friday evening schedule, departing every 10 minutes. For Blue Line departure times from 7th Street/Metro Center and Downtown Long Beach Station, please refer to Metro’s Service Advisories page. Please note these times may be subject to work-related delays. For those commuting between Downtown Los Angeles and Long Beach on Thursday evening, an alternative option is the Metro Silver or Green Line. Extra buses will run on the Silver Line after 9 p.m. on Thursday night, increasing the level of service to every 20 minutes. At Harbor Freeway Station, Green Line trains will follow the regular evening schedule, departing every 20 minutes. Blue Line riders may recall two previous nights this year during which trains followed the same 40-minute schedule between 7th Street/Metro Center and Willowbrook. The work this Thursday evening is part three of a four-part project related to the rehabilitation of the Blue Line train control/signaling system. To complete this task, old sections of rail containing embedded components are being replaced with new sections of rail with updated components. Because the work is occurring directly on a switch point, or crossover, trains traveling in both directions must take turns sharing a significantly larger segment of track than they would during routine maintenance. This is what creates the exceptionally long wait for trains between 7th Street/Metro Center and Willowbrook. The silver lining to keep in mind is this: the first of four sections was installed on the Metro Blue Line Friday, March 28. The second was completed Friday, April 18. After Thursday evening, only one more section will remain before we can say “adieu” to the crossover project (and “hello” to a more reliable Blue Line).